When I started this blog, I had no idea what I was doing. Three months later, I still don’t have the foggiest idea … but at least I have a place to unbottle all these thoughts in my head, and I finally know what a widget is! Can I just tell you? I can’t describe the terror I felt when I wrote my first post and pressed that “publish” button and sent it out to internet oblivion. Nail-biting TERROR. Eek, what have I done? Do I really want the world to read this, to know I struggle with all these strange symptoms on a daily basis as I fumble through motherhood and life? And then … the awkward quietness came, and it seemed like that post fell into a black hole somewhere, making me wonder … what if no one reads this? All of my inner insecurities came out of the woodworks, and I actually wanted to quit blogging after that first post! I am by nature, a very private person … and blogging about my life and struggles through chronic illness is not easy for someone like me. But the freedom came when I began to hear from some of you and began to read the honest, encouraging words of some of your blogs … and I began to realize that it’s a gift to tell your story — sometimes it’s all we can do to make sense of what we’re going through. So all that to say, I’m honored to be part of this blogging community! 1. I am former gummy bear and Red Vines addict. If it’s chewy and sweet, I crave it. These days, I “splurge” by eating unsulphured, unsweetened dried mangos. I can’t believe I’m saying this, but I actually get excited to eat prunes. Yes, I am quite the thrill seeker. 2. I play the piano. It’s therapy to me. But I was hardly formerly trained so this makes me self-conscious. One of my most favorite things to do in the world is to play worship songs on the keyboard with my husband on his guitar, and the kids on their ukuleles. 3. I have been journaling since the age of 10. I have always been obsessed with words and stories and expressing emotions through them. I probably have had over 50 journals – some are long gone, some are right near my bedside, and some probably need to be burned. 4. I cannot eat apple skins. This is ironic because I eat all kinds of “funky” things these days purely for their health benefits. I ate a chicken heart the other day and didn’t flinch. But apple skins are impossible. Do you know that awful feeling you get when someone scrapes their fingernails against a chalkboard? Yes, the heebie jeebies. That’s it! 5. I like ethnic food. I think Asian food is THE best. 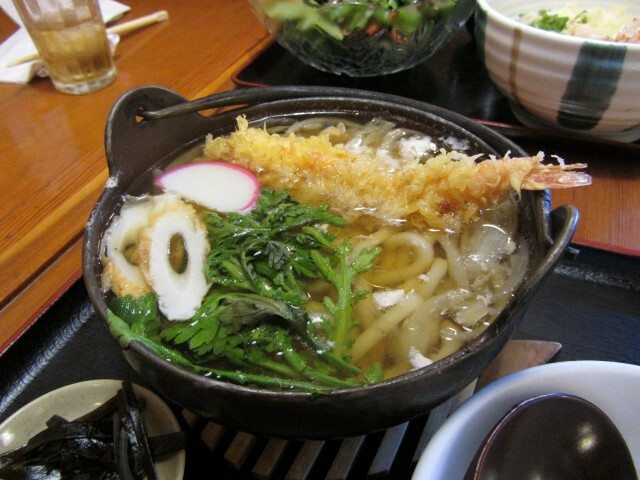 I think shrimp tempura over a steaming bowl of thick udon noodles in a piping broth garnished with shitake mushrooms and a soft boiled egg is the perfect meal. 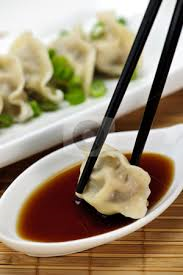 I could eat dumplings drizzled with soy sauce and chili oil sauce all day long. 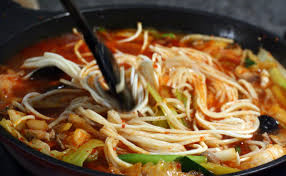 Spicy Korean noodle soups are my utter weakness. 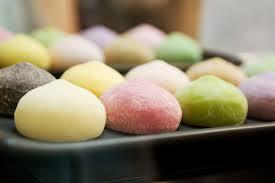 Japanese mochi (rice cakes) in all shapes and sizes and flavors – sweet, savory, pan fried, frozen and stuffed with green tea ice cream, red bean filled – makes me so happy. Of course now, I can’t eat any of this, not on a Paleo diet, but I’ve found some yummy grain free/Paleo Asian-inspired dishes that are just as satisfying. 6. I am petite, a tad under five feet. I am soft spoken, but according to my husband, I have a lot to say. Thank the person who nominated you for the award (and link back to the person who nominated you) in your post. Add the One Lovely Blog Award logo to your post, your blog or both. Nominate 5-15 bloggers who you admire and consider “lovely.” Let the nominees know they have been nominated by commenting on their blogs. Ha ha … I was too! The problem is now I have to be creative about modifying some of my favorite foods … which happens to be carbs … noodles, rice, etc! I have found some pretty good alternatives to satisfy that craving … but I just wish I had a personal chef to make it for me! I just found your blog a few days ago, and I love it. i am excited to follow it. I have fibro and migraines, among other things..LOL.but I just want to say, you do have a really lovely blog. Aww thanks. Thanks for your readership. I’m really sorry to hear you have fibro and migraines I understand some of that struggle … it makes life harder, but we learn to fight for what really matters. I’ll check out your blog too! ps- I find your aversion to apple skins particularly intriguing. Must explore this further.